The Para World Sailing Championships with the RS Venture Connect, the two-person keelboat Class for the event hosted by Sail Sheboygan & SEAS, in Sheboygan, Wisconsin USA has completed the training element to the event and kicks off with racing today. Some say that introducing two new things at once is dangerous, but at the 2018 Para World Championships these two new additions seem to be going down a treat. A new boat and a new style of racing has been rolled out at the championship with the hope of increasing the participation and provide some exciting racing. The boat: The RS Venture has been developed over the last couple of years to become a fantastic platform for every aspect of Para sailing. The boat allows a wide range of Para sailors to enjoy racing, as both manual and award winning electric control options are available. The racing: To put it simply the racing is short, fast and loads of fun. The reaching start followed by a short windward leeward course with a target race time of 15 minutes is a great watch. The 8 boat supplied fleet are split into 2 flights for each day. Each flight of 4 boats will have up to 6 races in a day and after 4 days of racing all the sailors will have raced each other. On the last day of racing there will be a semi final, followed by a winner-takes-all final. The supplied fleet format is clearly an important part for the growth of para sailors. 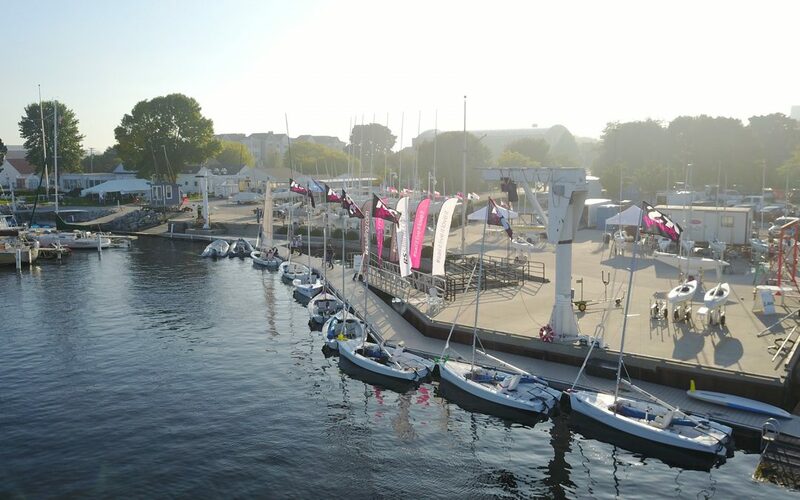 Having a fleet waiting at the venue will allow so many more sailors to take part. The RS support team have worked extremely hard over the last few days to ensure we have 8 RS Venture rigged and turned the same. This racing is about the sailors sailing skill. At the end of the practice day it was clear to see the boat and the format has provided an exciting new challenge the sailors. Lake Michigan laid on the perfect condition as the sailors and race team got to grips with the boats and the format. In true RS style beers (soft drinks were available) were provided for the exchange of a tally. It was great to see the PRO stopping by to check all were happy with the race format and course. Video from day 2 of training can be watched here. And the full playlist can be found here.